This scheme was launched in 2013-14 with a target to procure and distribute 100,000 laptops amongst the students studying in Pakistan and AJ&K. HEC was given the responsibility to devise the mechanism of distribution of 100,000 laptops after procurement through open competitive bidding. 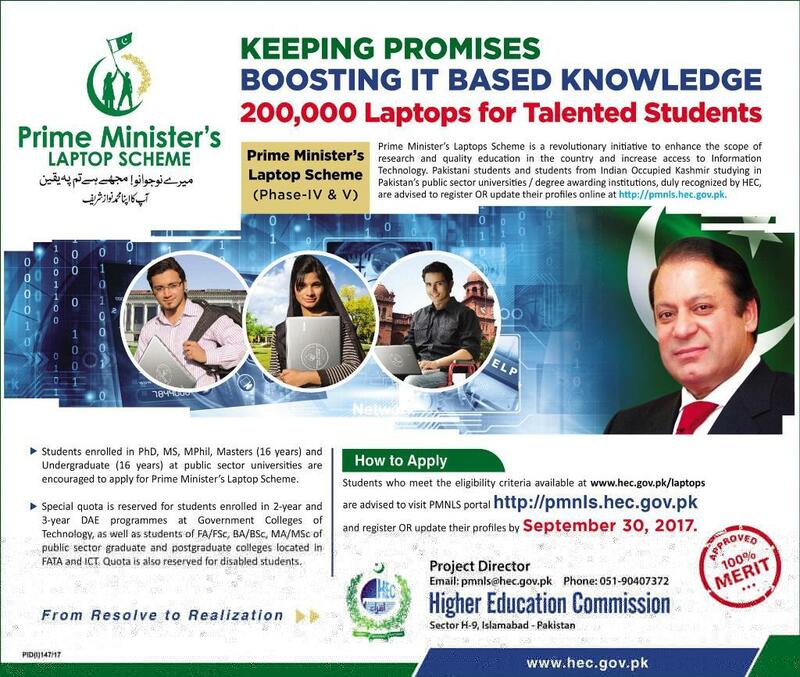 On the directives of the Prime Minister of Islamic Republic of Pakistan, the Government of Pakistan has initiated a national program for distribution of laptops to young and bright students studying in public sector higher education institutes (HEIs) across the country and Azad Jammu & Kashmir. The scheme is part of the Prime Minister's Youth Programs for FY2013-14. The Higher Education Commission (HEC) of Pakistan is the executing agency responsible for developing criteria, mechanism, modalities and a road map for procurement and distribution of laptops under this scheme. Similar to the past year, the scheme is conceived as a comprehensive ecosystem around the laptop instead of distributing "black boxes" to students. Ecosystem as envisaged around the laptop hardware for this project, consists of various components ranging from licensed/ genuine Windows 10 Operating System; Microsoft Office365 application software; Training opportunity at Microsoft IT Academy at respective university/ institutes; Microsoft Office Specialist (MOS) Certification voucher, 3G EVO Device; Access to HEC's National Digital Library using 3G/ 4G EVO Device and have opportunity to take online courses from world renowned universities on subsidized rates through https://pakcoursera.org. These aspects will not only bring value to money but will create synergy with relevant industries, as well as help HEIs to provide state-of-the-art technologically enabled academic environment at par with HEIs in the developed world.